I spend an awful lot of time banging on about all the brilliant books available for kids by other people. 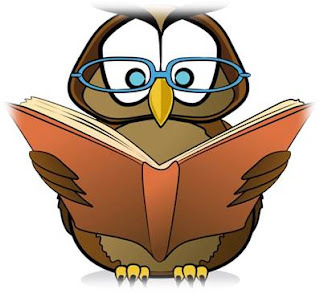 Well, it so happens, I have penned one or two worthy reads myself and in case you've been chained up in a chest in Hogwarts and have missed my many new releases, here's a recap. ALL the titles listed below are available now for Christmas or Easter or your child's next birthday or ... well you don't need an occasion to enjoy a great read now, do you? Here are my top Dimity Powell recommendations conveniently grouped for you by theme and age. (Either one or two of my short stories appear in each of the anthologies listed below). 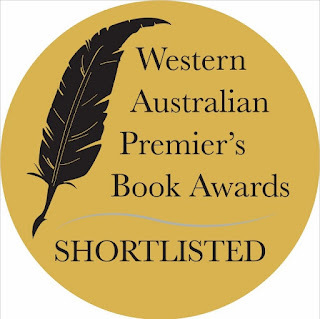 When ABC Radio Gold Coast asked if I'd be interested in sharing some book recommendations with their listeners, I didn't have to think too hard and long about the answer - YOU BET. I mean, after a bowlful of fruit mince pies slathered in brandy custard, it's practically what I live for - sharing great stories for kids with as many people as possible. 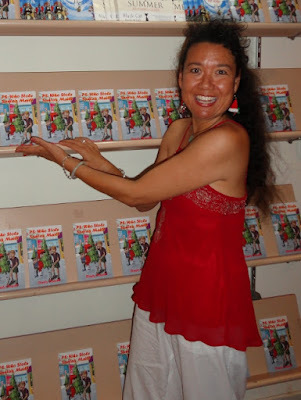 Teaming up with fellow Gold Coast author and illustrator, Angela Sunde, was the cherry on the pudding for me. 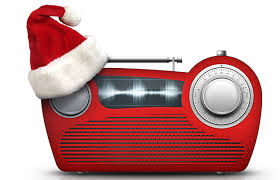 What better way to spend an hour or two chatting about books and ... for our first segment - yes, there will be more to follow 😀 - CHRISTMAS. We aren't quite Hamish and Andy but we LOVE BOOKS and we can't wait to share more of our recommendations with you all. The single most important thing in cultivating a love of reading in children is to engage them in the story. How this is done, through which ever medium, is almost inconsequential for the key to full engagement, I believe, will always lie within the story itself. If the heart of the story is strong and purposeful, if it reads true and speaks directly to the age group it is written for, then it will be a winner no matter how it is relayed. 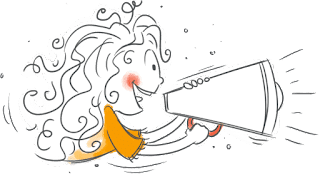 Forever mindful of this, I have been adapting a few picture book stories, written over the last decade or so, as creative content for the Kindergo app found at Kindergo Kids. Kindergo Kids is a safe, curated digital storytelling platform that delivers enhanced reading experiences for 2 - 5 year-olds. They provide quality, immersive, entertaining stories grouped on a variety of themed islands. These archipelagos of creative content offer youngsters and their parents, unlimited learning opportunities through self-navigation and discovery. It's spring time and we've been having a bit of a spruce up at Kids' Book Review. I can bearly contain my delight at having these beaut little bears (and one Koala) on board as our logo and on our new look banner. We owe our furry new look to KBR founder and editor-in-chief, Tania McCartney. And even though KBR now has a bear or two in there, we are still the same superlative, one stop reviewing site for all things in Kids' Literature. So why not pop in one day and visit me* and my fabulous team of contributors to discover what the bears are reading. 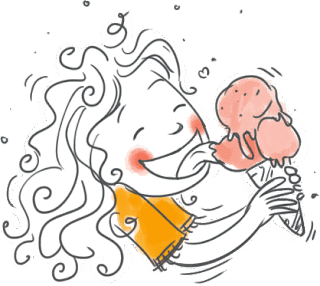 * I am Kids' Book Review's Managing Editor and therefore the biggest kid on the team who loves to while away her days in the wonderful, wacky, written world of words for kids. I've been tootling around writers' groups for over eight years or so now. They are always seeping with new knowledge, eager scribes and unbridled passion to pen something wonderful which often spills over into exciting writing projects. The Ten Penners is a group of dedicated writers that encompasses all these elements of story telling and more. 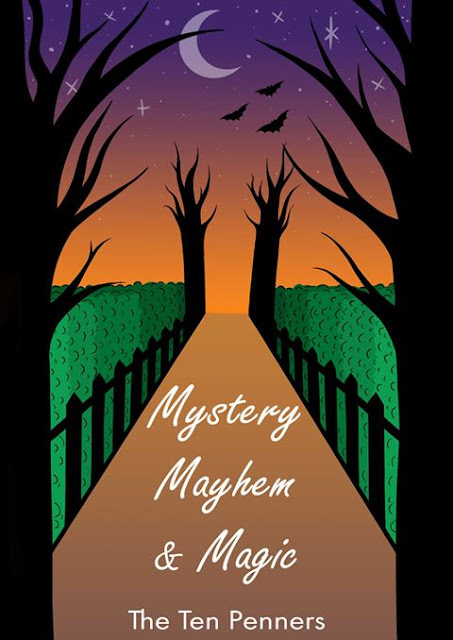 Today I welcome one of the founding members of this group,Marion Martineer to discuss more about their latest project, Mystery, Mayhem and Magic! Come with us as we launch into their Blog Tour. 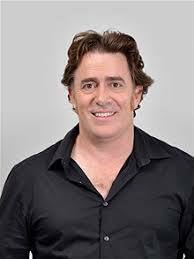 I was chuffed as monkeys with brass bells on to have been invited along to the studios of ABC Radio Gold Coast to chat with Matt Webber. I was also six weeks into a bout of this season's awful flu onslaught and feeling less like a chipper little monkey ready to chatter as I did something someone might find in their kitty litter tray. But chat I had to so off I hauled myself to ABC's delightfully located Gold Coast studios. My stories were not complete strangers to Matt's weekly Drive Time shows; my digital narrative for Story City,The Chapel of Unlove being featured there back in 2016. This time I was able to discuss the inspirations and motivations behind my picture book, The Fix-It Man and its implications with death and dying, this being a segment series topic featuring regularly on Matt's Drive Time. 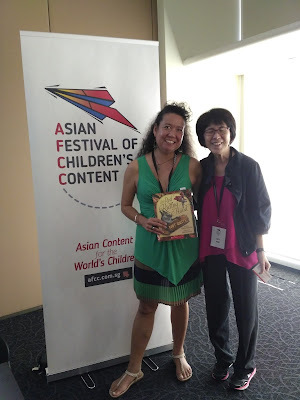 As weeks slip away into months I want to share one last session round up from my time in Singapore at the Asian Festival of Children's Content. It is the session I was asked to present on Bibliotherapy as part of the Writer's and Illustrator's Conference. My objective was to: Explore the value of creating bibliotherapy themed diverse picture books (PBS) and debate their usefulness in combating various social issues affecting children. To discuss what works, what doesn't and why. This sounds straight forward enough but past experience has shown me that when you add the word therapy to anything relating to Kids' Lit, it has an immediate polarising effect; people either love the term and what it infers or they are vehemently against its implications. So what exactly is Bibliotherapy and its implications? Perhaps one of the most stimulating sessions I moderated was Dr Ruth Wong's Interactive Narration: Having Fun with Postmodern Picture Books. Now although I consider myself a voracious and reasonably well-informed reader of picture books, the term 'postmodern' did befuddle me a little. It wasn't until I delved a little deeper into definitions that I realised, I had been savouring this style of picture book narrative for years. So what exactly is a postmodern picture book and what value do they represent for young readers. Ruth was on hand to explain. One of the highlights of the Asian Festival of Children's Content 2017 for me was the honour of moderating a number of sessions for other conference presenters. 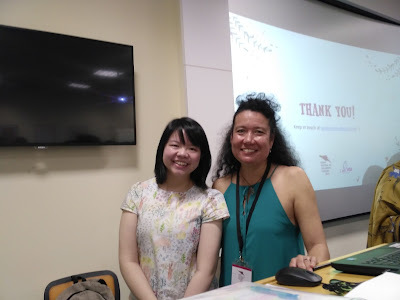 Through the pre-requisite to understand their topics and their associated backgrounds with Kids' Lit better, I was able to forge some truly rewarding relationships with people from Thailand, Singapore and, in the case of Robyn Soetikno, Indonesia. Robyn's session - Books for Indonesian Girls by Indonesian Girls: How Children's Books Shape Perspectives of the Worldfocused on her new series aimed at young pubescent Indonesian girls. The I Am Me series is a rigorously researched and thoughtful set of bilingual picture books designed to educate, inform and empower young girls with realistic expectations and useful information about their changing bodies and feelings. Bright, bold and unashamedly unambiguous, Robyn drew on her extensive health care industry background to develop this concept. 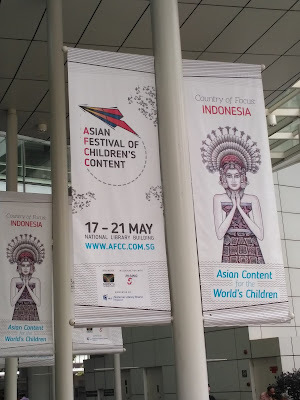 A memorable part of being involved in this year's Asian Festival of Children's Content was being asked to moderate a number of sessions for other presenters in addition to presenting my own. This was an opportunity I whole heartily embraced for it suggested a much more involved, hands on chance to become more intimately acquainted not only with some erstwhile unknown movers and shakers in the Kids' Lit stratosphere but also the topics they chose to discuss. I discovered, this in turn enhanced my own presentation for I was able to draw comparisons and find connections for delegates attending my session, thus providing a lovely continuity of content discussion. 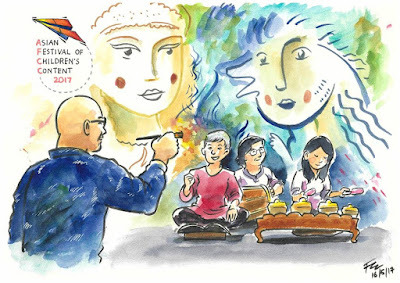 Throughout the Asian Festival of Children's Literature, I recognised a certain camaraderie of spirit among delegates and presenters alike. There pervaded a keen will to not only create emotionally and socially educational stories (or content) for kids that is both genuine and entertaining but to also somehow ensure that this content reaches it mark. In short, there exists in SE Asian a strong desire to share exciting, meaningful stories with kids from early childhood that offer them more than just a sound base from which to learn and excel academically. This is no easy feat for we creators, nor for the educators on the front line, in schools and libraries who may sometimes be restricted by mandates to deliver a certain type of content. This restraint of course is not exclusive to Singapore and her surrounding neighbours. So what do teachers really want? This next session highlighted some of the answers.